Ever wonder if Android users are having more fun? iDroid gives iPhone users the power to run a full Andorid OS on the iPhone hardware. Untill now the process of installing iDroid was tedious and very geeky. 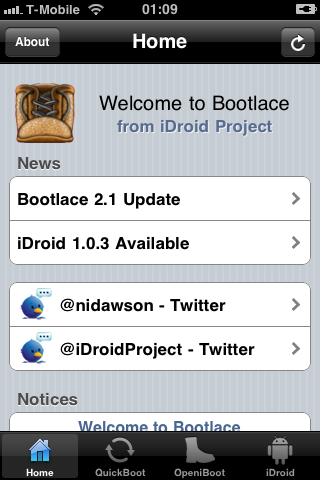 Now thanks to Nick Dawson’s BootLace it’s just a matter of a few taps here and there to get iDorid installed. Your device must be already jailbroken with Cydia. This setup works with 2G and 3G iPhones running iOS 3.1.2 to 4.1. Now just reboot your iPhone and Voila! 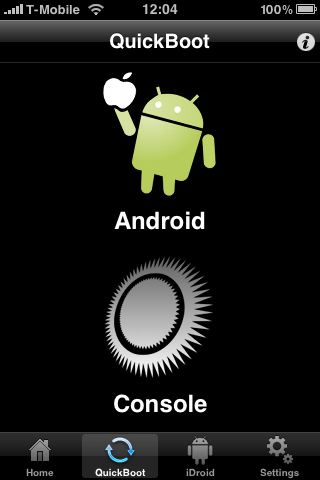 You’ll see a choice of operating systems too boot from: Andorid OS & iOS – in the QuickBoot tab. Once you’re done having fun with Android, if you wish, you can remove BootLace from iDroid and your normal iPhone bootup process resumes. Note: You can also install Andorid on your iPhone using another Cydia app called iPhodroid, although that process requires connecting to a computer and is more complicated. AppSafari review of iDroid with BootLace was written by Joe Seifi on November 8th, 2010 and categorized under Cydia Apps, Developers. Page viewed 11747 times, 1 so far today. Need help on using these apps? Please read the Help Page. after a.m. procedure at the time the quick boot started i noticed for a glance ~corrupted file or something else~ and my phone is dead, not even starting, … is there anything i can do to reverse such problem (say, ressurect it)and try all procedure again checking if there no corrupted file? tks and congratulate u for such good job.